These 4 companies are saving money in day-to-day operations. And they're doing it without affecting the customer experience. What began as a challenging economic cycle has spiraled into a recession. Most employers have laid off employees, put a hold on future projections and nixed large purchases for the sake of survival. It may leave you thinking there's nothing more to do but hope for the best. But many have refused to call it quits. The smartest have figured out ways to adapt their business practices. They are saving energy, discovering free advertising, entertaining clients on the cheap and, in general, saving money--from buying single-ply toilet paper to utilizing free website hosting, these entrepreneurs have savings on lock-down. 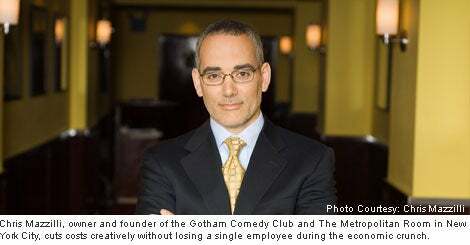 Chris Mazzilli, owner and founder of Gotham Comedy Club and the Metropolitan Room in New York City, knows cutting costs during the economic crisis is no joke. "I've been making changes here at Gotham Comedy Club and my other business, the Metropolitan Room, for about a year," Mazilli says. "One of the big keys for me was not to have our customers feel or notice any cutbacks whatsoever." He's switching to green products--napkins, paper towels and toilet paper--because there's a 10 percent to 15 percent savings. Though when Mazzilli first explored green products, he wasn't immediately impressed--his customers didn't like the rough paper products, and they were expensive. As the market for green products evolved, the quality improved and the cost decreased. He also retrained managers to send staff home during slow stretches. "What has very little effect on an employee saves a lot of money and jobs at the end of the year," says Mazzilli, who hasn't lost a single employee during the economic crisis. "If an average employee makes $10 an hour, just one hour a day saves you $3,650 a year." He's negotiated better rates at the hotels where he puts up performers. "We average $450 to $550 per room per night. Paying $50 less per night adds thousands to the bottom line." Shifting to e-marketing has also cut costs, as has shopping for wholesale supplies. In addition, Mazzilli has reduced the number of comedians per show when he features big headliners, which he says the audience appreciates because they see more of the main attraction rather than a string of lesser-known comedians. He's invested in a copy machine to do more in-house printing, bypassing copy or print shops. Together, these changes have added approximately $10,000 to his business's bottom line. Craig Heurung, sales manager of Spee-Dee Delivery Service, knows delivery companies, especially smaller specialty services, felt the sting of fuel cost spikes almost instantly. His first step was to focus on communication with his drivers. "Something as simple as educating drivers when it comes to fuel consumption can go a long way in cutting costs," Heurung says. He instructed all drivers to shut engines off whenever possible. "We tell them no more jack-rabbit stops, constantly hitting the brakes, or going nowhere in a hurry." Heurung says fuel consumption is the one cost they have control over. Spee-Dee, a regional delivery service, has more than 1,000 trucks on the road. For longer-distance travel, Spee-Dee, along with other delivery services, has made speed moderation mandatory by installing governors on its fleet. Governors are a part of a one-time-cost software program. One supplier is Auckland, New Zealand-based EFILive. The cost varies depending on the software and the system, but the programs begin at about $250 and run as high as $2,000. Spee-Dee began implementing the software about two years ago and now all of its trucks are equipped with it. The program usually pays for itself in less than two months--gone are the days of the careening, speeding 18-wheeler. The speed governor works like an airplane's black box, showing a detailed history of the driver's actions and behaviors behind the wheel, including braking and accelerating patterns. If the driver displays disturbing or dangerous patterns, management can educate him to avoid tickets, which results in decreased insurance rates. "You may have noticed [delivery trucks] going slower on the freeways," Heurung says. "Everybody's doing it." Paying close attention to its delivery route schedule is another way the company has saved. Restructuring routes to avoid overlap has netted Spee-Dee tens of thousands of dollars a year. "We plan our routes better so we don't have wasted trips." Cortni Marrazzo, owner of virtual assistance and design company Essential Excellence, felt the pinch long before the economic cycle had officially been declared a recession. After being laid off from a government job in September, she immediately started her home based company, officially launching it in November. Sticking to a shoestring budget was vital during startup since her husband's work provided the sole family income at that time. Marrazzo concentrated on finding money-saving techniques of low- to no-cost.. The savings are small, but combined, they add up to big savings annually. Price matching can cut costs in half for her business. When shopping for office supplies, Marrazzo checks online at Office Max, Staples and Office Depot to compare prices. She finds out which businesses offer price matching and goes to the nearest store to get the same price. Recently, on Costco's website, she spotted a box of 100 sheets of pre-perforated business cards, equaling 1,000 cards, for $27.99. Office Depot's price was $54.99, but when she brought the ad in, they matched the price. With shorter checkout lines at Office Depot, this small step gave her more time to put into her business. Marrazzo also saved on internet and phone costs by wrapping up a package deal with a VoIP phone. Before starting her business, she paid $20 per month for basic phone service alone--no long distance or internet included. During startup, she researched all-inclusive phone and internet packages and found Vonage. For $30, the package gave her unlimited local and long-distance, and free landline calls to a few European countries. "I didn't even have long-distance calling before this, but it was very important, because I wanted to offer services nationwide. This way I wasn't limited to doing business in the city I live in," Marrazzo says. An added bonus: two months free at sign-on and an additional two months for free for referring her mother as a customer. By signing up with Microsoft Office Live Small Business, Marrazzo gets her website hosted for free. (Any website up to 500MB is free with unlimited pages and only a small monthly fee applies for larger-sized sites.) The first year of custom domain name hosting was also free, with a $15 annual fee thereafter. In addition, Microsoft provides numbers on site traffic and where it originates. "I can direct my advertising based on the ages and preferences of those visiting my site most," Marrazzo says. Many office supply stores offer rewards programs that will give you back a percentage of what you spend in the store. Marrazzo uses Office Depot Worklife Rewards and Staples Rewards. "There is no cost to sign up. I earn 10 percent back on ink, toner, and paper, and 1 percent back on almost all other purchases with a few exceptions. It varies from store to store," she says. MaxPerks also offers free sign-up and she earns $25 for every $500 spent at Office Max. "I'm going to use the savings for future technology purchases and upgrades," Marrazzo says. Marrazzo finds discounts when she meets with clients. Instead of lunch, she holds business meetings at Starbucks and uses the Gold Card. Coffee is a less expensive alternative to a business lunch, averaging about a third of the price of a full lunch. An average business lunch is approximately $25 for two, while two lattes will cost about $8 or $10, tip included. Plus, with two hours of free Wi-Fi a day, it's a convenient way for Marrazzo to multitask between client appointments. Still, Marrazzo says sometimes a business meeting requires chatting over a meal. She frequents restaurants like Applebees, Chili's, Olive Garden, Red Robin and Red Lobster that offer two-for-one coupons for those on their e-mail list. Additionally, many restaurants send a free birthday coupon via e-mail or offer punch cards boasting the 10th meal free. When Marrazzo works from home, she saves more than $100 per month on energy bills by using a small space heater as opposed to heating her whole house. She closes the door to keep the heat in, which gets the office up to about 80 degrees while the rest of the home is about 60 degrees. 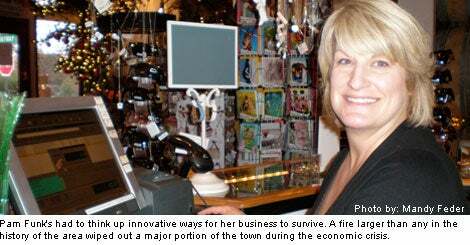 Amid the economic collapse, a second blow threatened to level Pam Funk's business this year. The largest fire in the history of the town closed the doors to many businesses for weeks and others for good. She lost more than 30 percent of her annual revenue during that time. In response, she cut payroll by about 30 percent. Funk did this by evaluating the previous year's hourly sales for that same week and scheduling the maximum staff during the projected busy times. She also spent more time working in the store. "While it's difficult to work on your business when you're working in your business, it's been necessary to do the double duty. I've also utilized the employees that have the best sales skills as well as [those who are] the most efficient in overall running of the store, no matter how long they've been with us," Funk says. Since the business requires specialty lighting that can be expensive, she replaced many bulbs with energy-efficient light bulbs, including spots over display windows. Those are on a timer so they are getting optimum exposure of the display windows at night, without running all night. "I don't turn on the expensive lighting until right before the store opens, and they are the first to be turned off after closing," Funk says. Instead of turning on the heat, Funk waits for the sun to shine in to heat the store. In the summer, she hangs fabric in the windows to block the sun. As a result, she reduced the electric bill by 32 percent. By cutting back 80 percent of print ads and sending more direct mail to high-frequency customers, she gets the highest return for her advertising dollars. To draw more customers and encourage their loyalty, Funk signs people up for her e-mail list and sends coupons. She makes every customer aware of a frequent buyer program that offers a 10 percent reward return as well as a monthly birthday coupon program. But she's even found ways to save time and money on that strategy. "I used to send them out to everyone on our list. I now limit it to only those who have shopped with us in the last year," Funk says. Funk ensures she's sending to the most current customers by cutting out "return to senders" or bad addresses. In addition, "Thank You for Shopping with Us" coupon-postcards reward those who joined the e-mail list the previous month. Funk says when she can get a customer to return to the store within a month of first visiting, there's a better chance of making her a regular customer. As an extension of her business, she also offers a wine shop that features tastings on weekends, producing many empty bottles and corks. In the past she recycled all of them, but now Funk finds ways to re-purpose them. "In our art glass studio, we slump the wine bottles into cheese platters, decorate them with wire and beads, add a cheese spreader and sell them. We also cut the corks in half and glue them onto a footed wood frame and make trivets out of them." This saves her from ordering those items from a vendor and they return about 90 percent profit, according to Funk. From treating clients to Starbucks to recycling wine bottles for art projects, each of these entrepreneurs is battling the recession with resourcefulness and streamlined practices. The best part is that it only takes a moment to consider a cheaper alternative, and the creative cost-effectiveness will pay off in the long run.